Letter from W.H. Davis(? 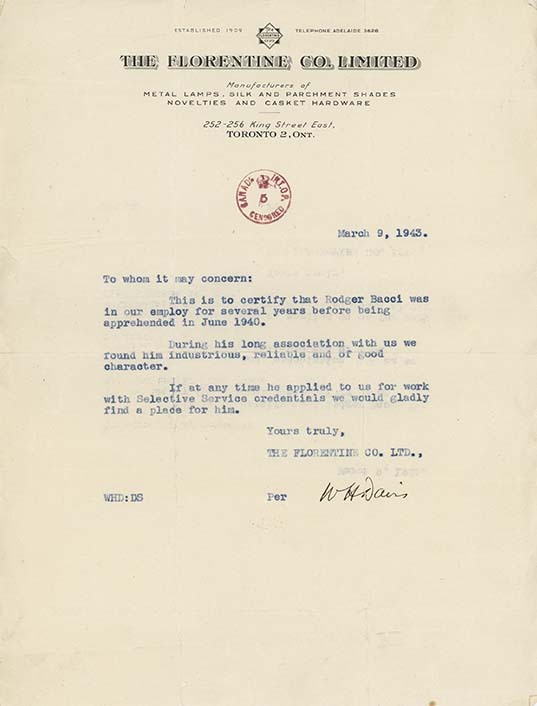 ), The Florentine Co. Limited, March 9, 1943, on behalf of Ruggero Bacci. Ruggero Bacci was employed by the company at the time of his arrest. In fact, he was taken directly from his workplace, along with co-workers Antonio and Pietro Danesi, and the co-owner of the company, Massimo Iacopo Magi. This is to certify that Rodger Bacci was / in our employ for several years being / apprehended in June 1940. / During his long association with us we / found him industrious, reliable and of good / character. / If at any time he applied to us for work / with Selective Service credentials we would gladly / find a place for him.